Beacon Hill, often used to refer to the state government in the same sense that “Washington” is used to refer to the federal government, is the area north of Boston Common bounded by the arch of Cambridge Street. 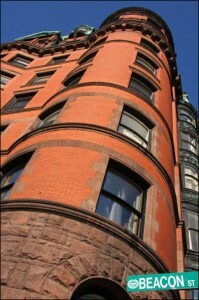 Beacon Hill is as notable for its seat of government as it is for its residents, including such notable figures as Ted Kennedy, John Kerry, Robert Frost, John Hancock, Louisa May Alcott, and Oliver Wendell Holmes, Jr.
Beacon Hill derives its name, aptly, from the beacon light which once stood atop the hill to warn sailors. Formerly owned by William Blackstone prior to its sale to the Puritans, Beacon Hill experienced a bout of racial segregation in the 19th century, with white residents inhabiting the north side of the neighborhood and African-American residents on the south side. This concentration of ethnicities led Beacon Hill to play a significant role in the anti-slavery movement, with prominent speakers such as Harriet Tubman, Sojourner Truth, and Frederick Douglas speaking at the African Meeting House. Many of the prominent buildings of the Hill was designed by Charles Bulfinch, with his most notable work being the Massachusetts State House. Many of the larger houses in the neighborhood are built in the Colonial Revival or Greek Revival styles. The rest of the residential area of the Hill consists of narrow, tightly packed brownstones primarily in the Federalist style.